Windermere village grew around the railway station, about a mile and a half from the lake. The village was originally called Birthwaite, but the railway company decided to call the station after the lake. 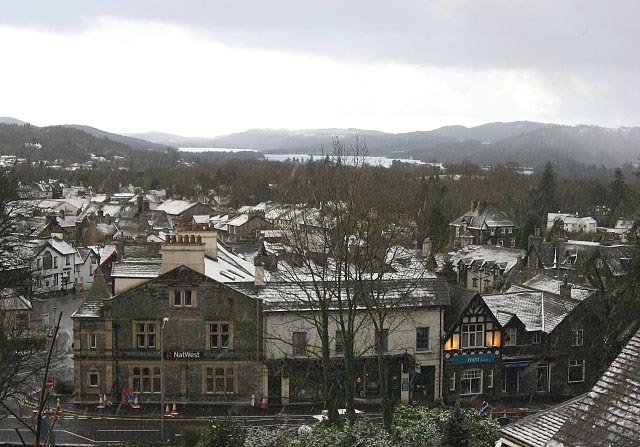 Over the years, the village has become merged with the older lakeside town of Bowness-on-Windermere, though the two have quite separate centres. Windermere village and lake with Coniston fells beyond. Photo by Dave Brown. The Terrace is a unique row of Grade II listed large holiday homes, located in the heart of Windermere village but within private grounds. Designed by Augustus (AWN) Pugin (1812-1852), these cottages are believed to date from 1849, and were originally built for railway executives from Windermere Station. There is a hierarchy to the houses which is said to relate to the position of the executive that owned each house. At one time the gardens were terraced down to the railway station, which is where the name The Terrace originally came from. The fire places in Alice Howe and Boston House are said to be replicas of a fireplace within the Palace of Westminster in London. 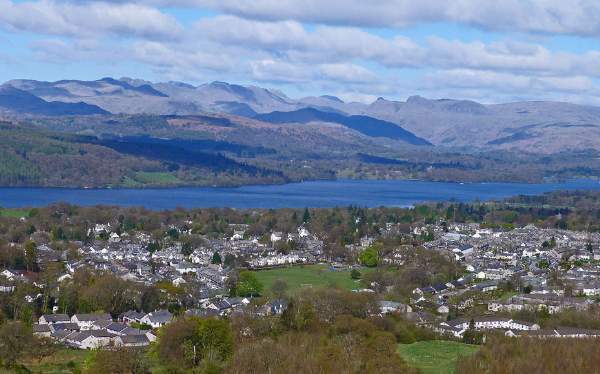 Windermere village and the lake beyond, from the footpath to Orrest Head. Photo by Ann Bowker. Windermere station offers train and bus connections to the surrounding area. The Lakes Line connects with Oxenholme, for interchange with the West Coast Main Line. Beside the station is the main store of Lakeland Limited, a chain of kitchenware stores. 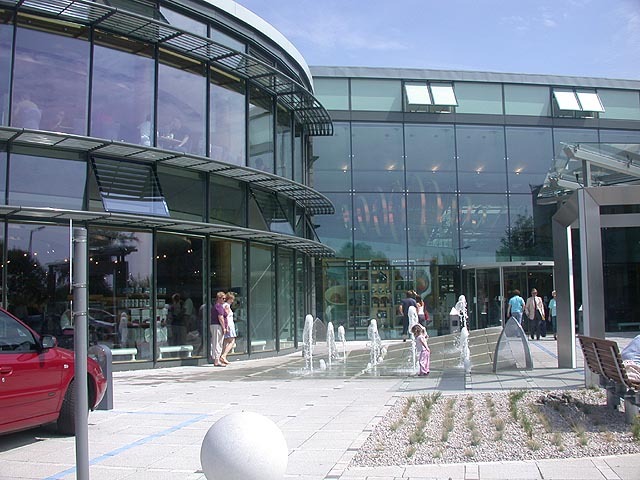 It is still based where it was founded in Windermere, in the area the company is named after. Lakeland Limited at Windermere Station. St Mary’s church was built as a chapel in 1848, though it has had extensive renovations and alterations since. A short walk from Windermere takes you to Orrest Head, an outstanding viewpoint. It was the first ‘summit’ in Lakeland visited by A Wainwright, author of the famous guidebooks, in 1930. The Cedar Manor Hotel – boutique hotel within walking distance of Windermere village centre. 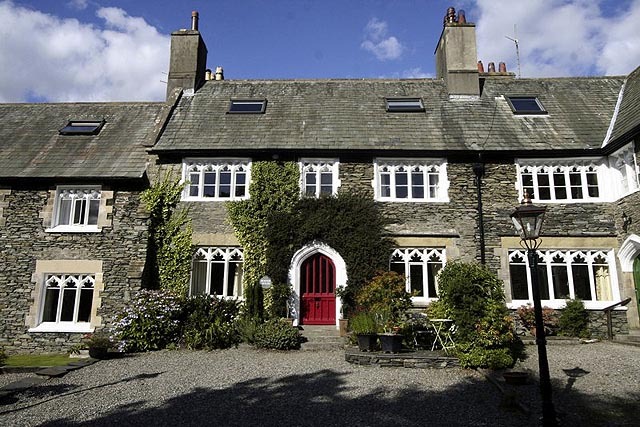 1 Park Road – a luxury bed and breakfast in the heart of Windermere. Pet Friendly.